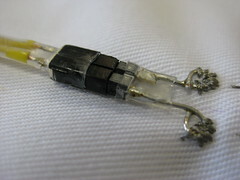 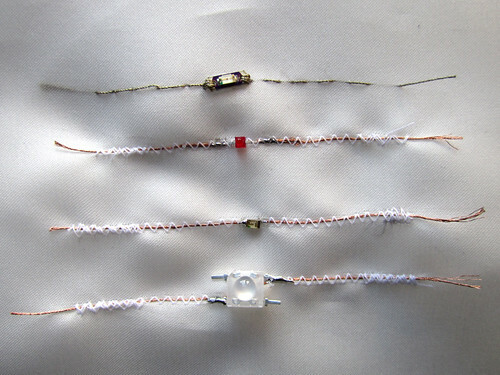 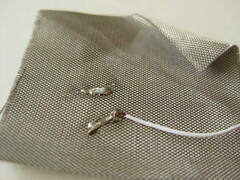 There are a range of different possibilities to connect conductive materials. 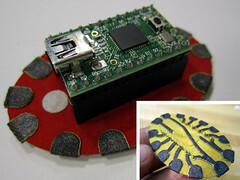 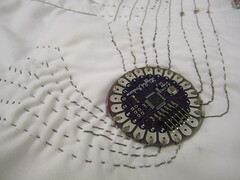 One of the hardest and at this point very relevant one in textile electronics is the hard/soft connection between conductive textiles and traditional components and circuit boards. 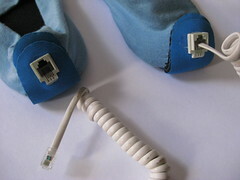 Most connections are a combination of permanent and plugable (de- and re- attachable) connections. 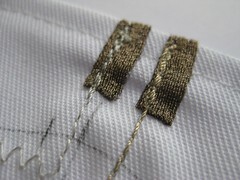 Here we try to list some of the permanent connections that we frequently use in our own work. 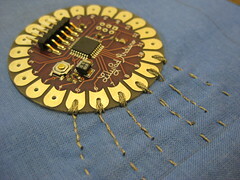 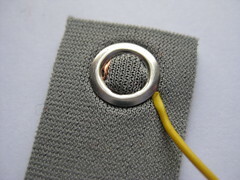 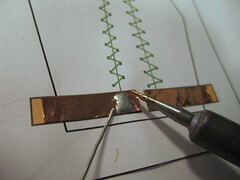 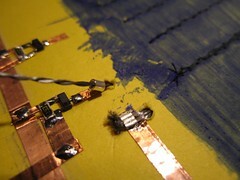 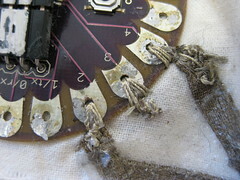 Using fusible interfacing to connect conductive fabric strips to perforated circuit board. 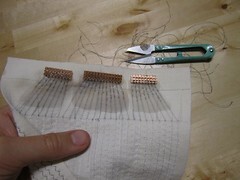 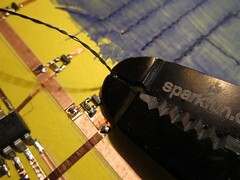 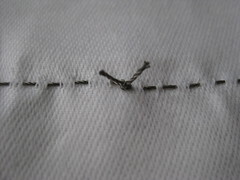 Sewing with top conductive thread to fabric breakouts and soldering wires to perfboard. 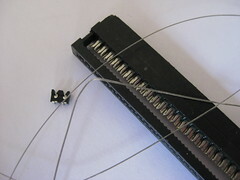 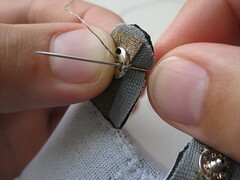 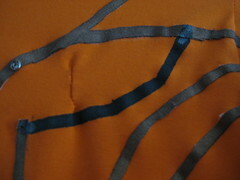 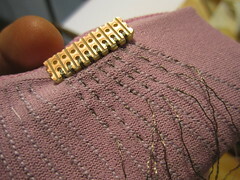 Using zigzag stitch on sewing machine to sew top conductive thread over stripped ribbon cable wires. 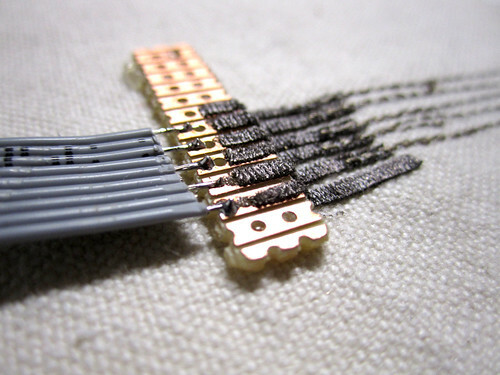 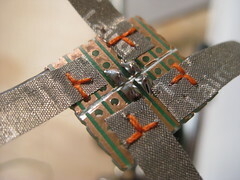 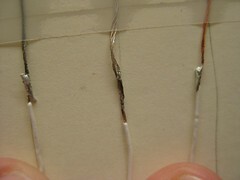 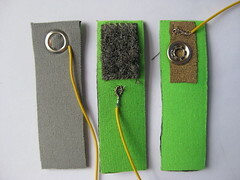 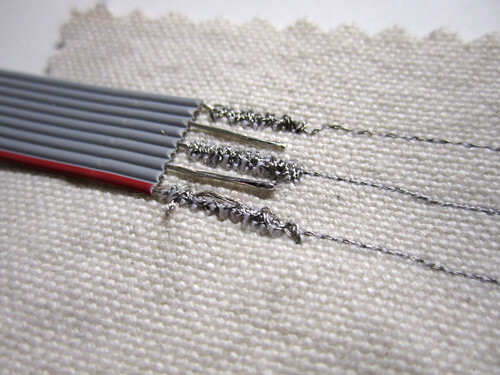 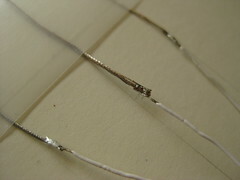 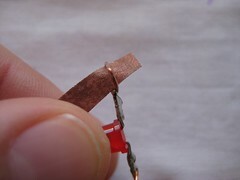 Sewing to Plug and Wear’s knit breadboard fabric (right: with top thread conductive, left: with bottom thread conductive) and then soldering wires to the breadboard traces which are very thin wires. 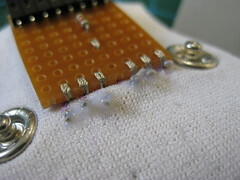 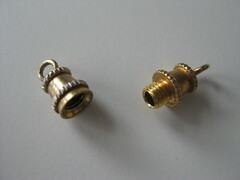 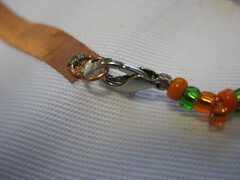 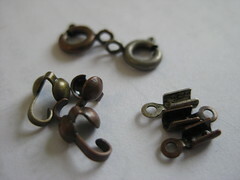 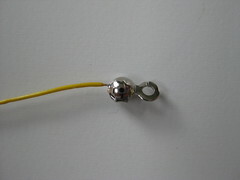 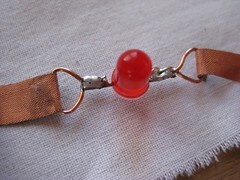 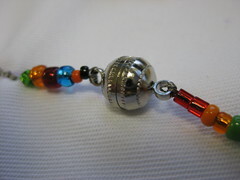 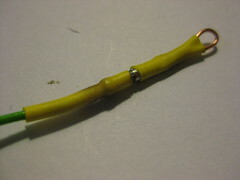 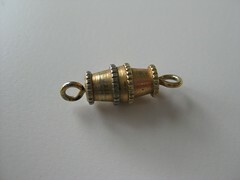 Crimp beads are solderable, squishable and sewable, making them great hard/soft connectors. 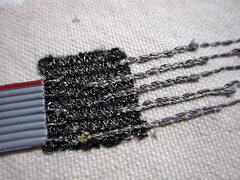 This is definitely one of the most reliable hard/soft connections i have found, but it is is very time intensive to sew. 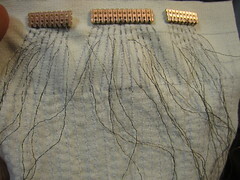 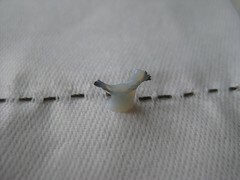 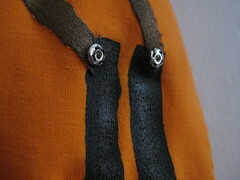 After sewing the connections it is good to isolate and protect the threads with a stretchy glue or silicone. 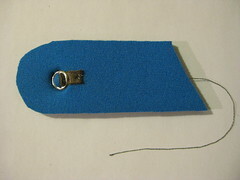 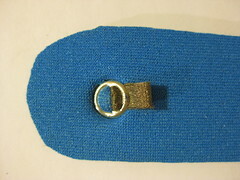 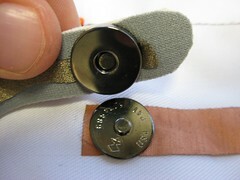 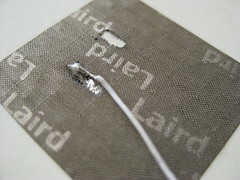 Pierce through conductive fabric tab. 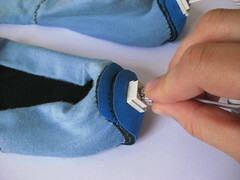 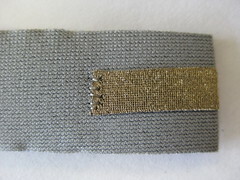 If working with conductive thread, sew with thread to this tab, otherwise continue with conductive fabric. 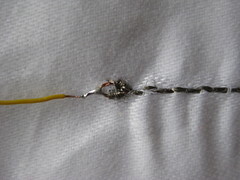 Enforce fabric behind poppers, so that popper does not tear hole. 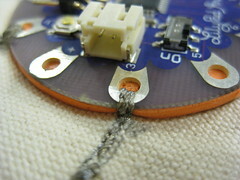 Use some squishy material underneath the LilyPad to help improve the electrical contact between soft thread and hard circuit board. 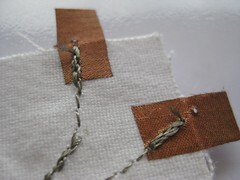 There is a nice PDF from Dr. U. Möhring of the The Institute of Special Textiles and Flexible Materials at the TITV Greiz that contains some photos of hard/soft connections. 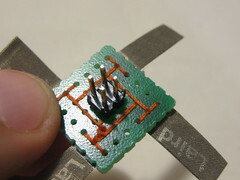 With the difficulty that comes with hard/soft connections, sometimes it can be nice to simply solder things together. 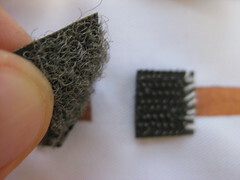 There are lots of nice permanent soft/soft connections available for use in soft circuitry. 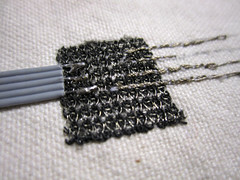 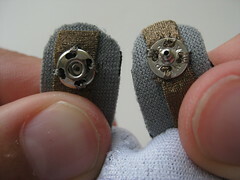 Many of these use conductive fabric, conductive thread and conductive velcro. 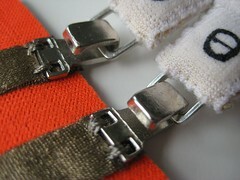 Some are more durable, washable or strainable than others. 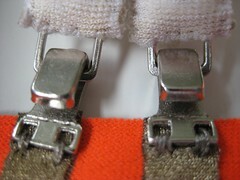 Sewing machine or hand sewn. 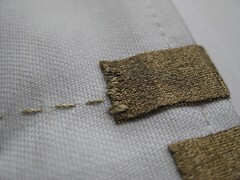 Overlapping conductive fabric traces with fusible interfacing in between, conductive connection goes through fusible interfacing. 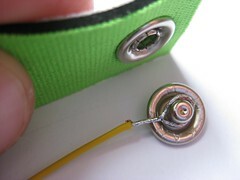 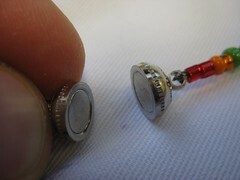 It is good to use some glue or anti-fray on top of conductive thread knots as they really like to come undone. 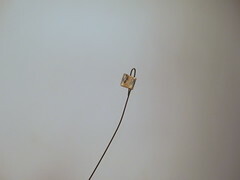 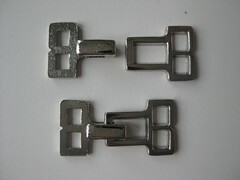 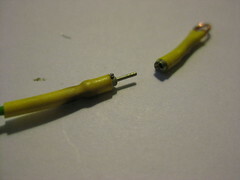 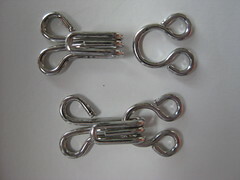 Most plugable connections require some soft of permanent connection that connect to the actual plugable part. 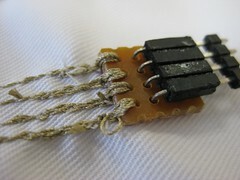 Suzyi Pakhchyan uses this method in her Smart Mobile project, featured on page 191 of her book Fashioning Technology. 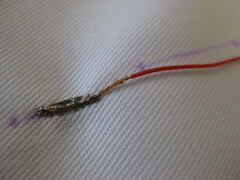 4-6 connections. 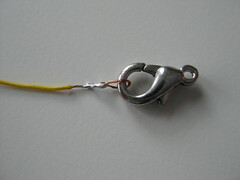 Nice because of stretchiness of the cable. 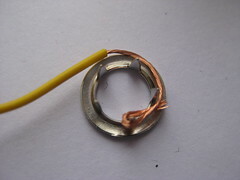 Cheap because most 99cent stores carry phone cables and sockets. 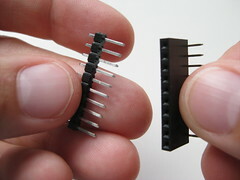 Although cheap sockets tend to be buggy. 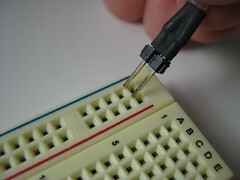 I miss pictures from hook to loop > IDC connectors. 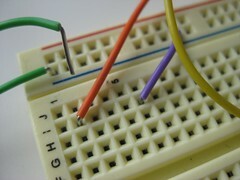 Images contribute a lot to this database! 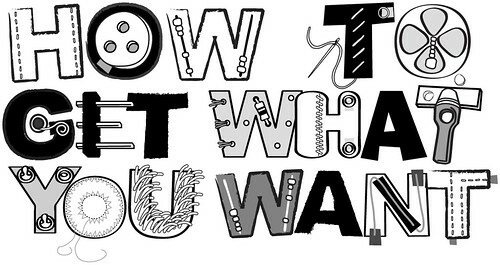 Makes it easy to understand and takes away any hesitations that non-tech people might have.